Indian support for the Kashmiri people after devastating floods should not be politicized. 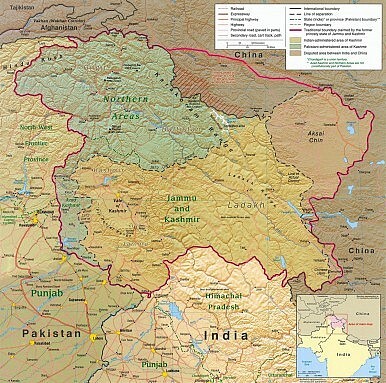 The region of Kashmir in India is experiencing calamities of a sort that have not been seen there for over a century. Heavy monsoon rains have led to massive flooding in Kashmir and in neighboring Pakistan. Images of the flooding in the Kashmir valley leave one completely numb. All kinds of communications have broken down. The situation is so grave that even the Indian home minister cannot establish contact with the Kashmiri civil administration in the state capital Srinagar. The chief minister of the state, Omar Abdullah, is himself marooned. However, both the Indian army and civilian volunteers are assisting people during the flooding. According to various reports, over 500,000 people are still stranded in Srinagar and southern Kashmir. Around 300 people have already lost their lives. The loss in terms of property, savings, and personal belongings is enormous. There are many who lost everything. Only after the floods cease can the magnitude of the tragedy can be fully assessed. But one thing is clear: it will take years for the state of Jammu and Kashmir to recover and rebuild. The tragedy in Kashmir is a big challenge for the rest of India. It is often said that tragedy unites and this tragedy can unite the people of Kashmir with the rest of India’s people emotionally. It is time for India to stand up behind the people of Kashmir in this hour of crisis and help them overcome this natural disaster. Like it did during the tsunami of 2004, the Gujarat earthquake of 2001, and the floods in Uttarakhand in 2012, the Indian government needs to demonstrate its commitment to the victims — this time, the people of Kashmir. This can help build ties between Kashmir and the rest of India, a relationship that has often been tense. For many Indians, the divided loyalty of Kashmiris has been a matter of great rancor. They have seen the Kashmir issue through the lens of security rather than trying to make the people of the state feel Indian. These floods give Indians the opportunity to build an emotional bridge with Kashmiris. Indians can reestablish the slowly eroding trust between Kashmir and the rest of India. It is also time for the Indian army to repair its relationship with the people of Kashmir, who often consider the military to be an occupational force. The army has been the real savior of the hundreds of people in Kashmir. At a time when the civilian administration has completely collapsed in the state after days of rain, the men in uniform have reached countless stranded people and provided them with food and shelter. People, forgetting their anger against the army, have welcomed them into their homes and sought their support. The army even rescued some secessionist leaders who had campaigned against it in the past. Can such help by the Indian army be used to justify the army’s rule in Kashmir and its excesses? A section of the Indian media and some political forces are actually making this argument. They are using the army’s help to justify the Armed Forces Special Power Act (AFSPA), a law that gives unlimited power to the armed forces to arrest anyone without a warrant. People in the Kashmir valley see it as an instrument of repression. Therefore, if the humanitarian help of the military is instead used to justify further military oppression in Kashmir, it could further alienate many Kashmiris from Indian rule. The floods have given India an opportunity to bridge the fault lines that exist between Kashmir and rest of India, and write a new history of togetherness between New Delhi and Srinagar. One constant complaint of Kashmiris has been the Indian state’s refusal to grant them the same rights and freedoms that the country’s other citizens enjoy. This is the time to make the people of the Himalayan state feel the same as everyone else in India. This is the time for India to demonstrate how much it cares for Kashmir. Indian Prime Minister Narendra Modi was very prompt in offering help to Kashmir a few days ago. However, if this support is projected as Narendra Modi’s generosity towards a recalcitrant people, as some of his supporters spin it, it might hurt the sentiments of the people. It might neutralize all the good work done by the army, the government of India, and various civil society groups. Elections are due in Jammu and Kashmir later this year and the Bharatiya Janata Party (BJP) has high hopes of emerging as the winner in Muslim-majority Kashmir. But politicking at this stage might prove costly for the ambitions of the Hindu right-wing party. It is the time for all parties to rise above petty politics and express solidarity with the people of Kashmir in this hour of crisis. We need to show our loyalty to the people of Kashmir valley. It is time for India to redeem itself in Kashmir.